Last week was another tragic week following the deaths of two black men at the hands of police under dubious circumstances and five police officers in Dallas by a disturbed black man using a #BlackLivesMatter protest as cover. But just as disturbing was the method used to “stop” the Dallas shooter… not “capture”, “arrest” or “subdue”, but the outright “execution” of the gunman… former military and possibly suffering from PTSD. After shooting and killing FIVE of Dallas’ finest, the man HAD to be stopped. There is no question of that. But the “final solution” (pun intended) was to bypass DUE PROCESS and simply execute the gunman by sending in a robot to plant a bomb and detonate it with him inside. Now, NO ONE is defending the life of the gunman over the lives of the officers he killed. If you think that’s what this story is about, you’re sadly mistaken. No. This is about the “slippery slope” of granting an already overly-militarized police force the power to perform summary battlefield executions without benefit of trial. Back in the 1976, an obscure British comic book anti-hero was created called Judge Dredd (you’re more likely to know the mediocre 1995 Stallone film of the same name [or its 2012 remake].) Dredd was a future police officer in the far-off year of 2000. Thanks to an over-burdened court system due to too many criminals thanks to the collapse of society, officers like Dredd were bestowed the power of “Judge, Jury & Executioner“. Don’t bother arresting a person if caught red-handed, simply sentence them to “death” and execute them on the spot based solely on the officers own judgement. No muss. No fuss. Police officers in this country have the SOLE job of apprehending criminals to stand trial. Officers may carry guns to protect themselves and others. They may NOT simply execute a suspect, denying them “due process”, and certainly not by planting a bomb. to blow them up when they won’t surrender. Again, I repeat my point about not defending the shooter nor his actions. That’s not the point. His crime is not the point. Whether he deserved what he got is not the point. This is about power we are ceding to an already over-militrized police force that is looking more and more like an occupying army with each passing year. Gone are the days of “Officer Bob” patrolling his beat… the same city-street day after day, getting to know the residents by name. Urban sprawl has made that all but impossible today. And with a Congress that is unwilling to deny the mentally impaired or even terrorist suspects from purchasing a firearm, no wonder our streets look more like warzones and our police like soldiers. Following the scandalous Nixon presidency, Jimmy Carter ran for president vowing to “never lie to the American people”. No way to know if he kept that promise, but we KNOW no one else since has. Whether or not it is ever justified is not the question. It’s a power we surrendered to those who have proven they can’t be trusted with that kind of power. In the Dallas Shooter case, WHAT IF police had instead pumped the building full of tear-gas or sleeping-gas, allowing them to take him alive? If that were an option, would you STILL have advocated the use of a BOMB sent in by robot to execute him? Would it matter to you if this were a former soldier suffering from PTSD? 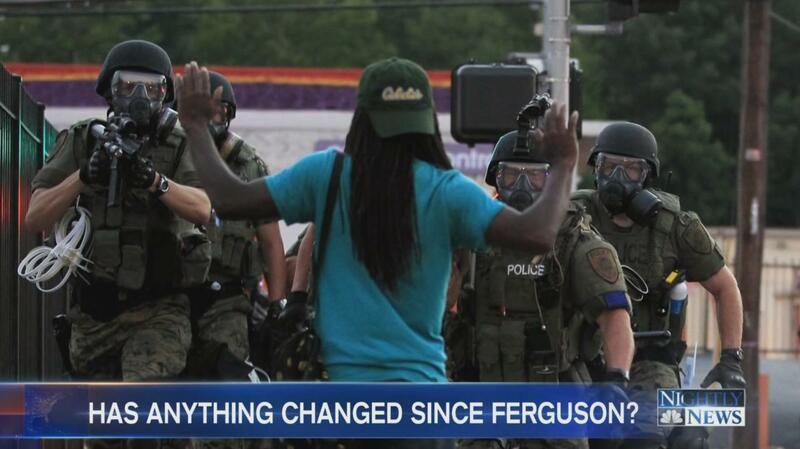 We’ve all seen police in riot gear with bullet-proof plexiglass shields. If the police could not go in after him, could a “hostage negotiator” have talked him into coming out with his hands up (don’t shoot)? Was the weaponry he was using too deadly to make that worth risking? And if so, whose fault is THAT? If you’re asking why an irrational man committing an irrational act didn’t rationally surrender to spare his own life, that in itself is not rational. And just how certain were they he didn’t have a hostage or that no one else was in that building before setting off that bomb? I stress again that this is NOT about defending the man who killed five police officers. It is about deciding whether or not we want to confer the power to deny Due Process… a right established in our Constitution and reserved to the COURTS… to a police force that already behaves like an occupying army in the middle of a warzone (and further justifying the sale of military-grade hardware to the general public). It’s a slippery-slope… or so the gun nuts keep telling me.